As an entertainer the most difficult part of a wedding reception is room turnarounds. This is the term used to describe changing the layout of the room after your wedding breakfast when it turns your restaurant style room into a function room style setup and the top table usually gets removed. This is probably the most stressful part of the day for the venue staff, entertainers and any other supplier that you’ve hired for your wedding reception. The reasons are very simple. The staff have usually less than an hour to clear the tables and clean the room and then set the room up for the evening reception. It’s also a time when the bride and groom want their evening reception to start as soon as possible, especially if they’ve already encountered a delay earlier in the day. This often means the bride and groom asking the function manager or manageress “when will it be ready” This puts a lot of stress on the function manager and consequently their staff. As your wedding reception entertainment it usually takes me 45 minutes to set up my mobile disco during room turnarounds and 45 minutes for a dance floor and 30 minutes for a photo booth. This is always assuming I can get clear access to where I’m setting up and that the venue has made a space available for me in a timely manner. When I’m supplying multiple items for your wedding reception I bring in extra staff so room turnarounds are done quicker. My Silver package mobile disco at Bunchrew House Hotel. The biggest problems I have, at wedding receptions, as a Dj, dance floor and photo booth supplier during room turnarounds are guests standing in doorways blocking access or not leaving the function room quickly enough. This impacts not just me, but every supplier plus the hotel staff who are under pressure for your evening reception to start on time and ultimately you. Room turnarounds are incredibly stressful for everyone involved. I would always suggest that every bride and groom having a wedding reception is made aware of this problem so they can personally invite their guests into another room while room turnaround is being done. I hope that this blog post gives you an insight into the behind the scenes pressures and problems arising due to room turnarounds and what you can do to help. Function managers can make an announcement about room turnarounds but in my experience coming from the bride and groom themselves it works much better. You can shepherd people far better as you know them personally. 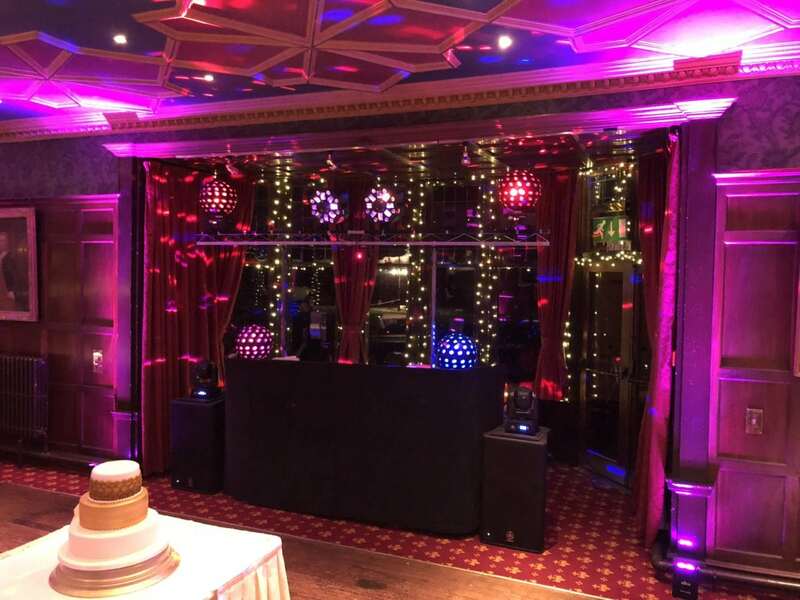 Some hotels have room turnarounds down to a fine art and clear the top table first which is usually where the Dj or band will go as it’s the natural focus point of the room. They will then clear the rest of the room and this makes for very efficient room turnarounds. Unfortunately some venues are atrocious at this and I’ve seen me having to ask them to clear my area first or actually doing it myself. If I can’t get access to set up, my 45 minute disco setup time gets longer and longer. It’s not rocket science but you’d be amazed how rarely this is done right. There are two venues that I’ve been to recently that are stunning examples of wedding reception efficiency and their room turnarounds are incredibly fast. Bunchrew House Hotel near Inverness is one of them. 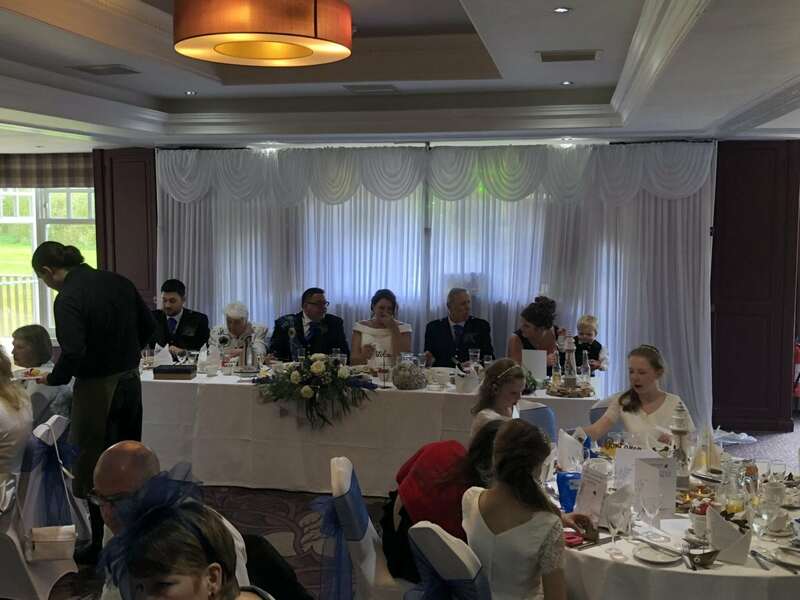 I did an all day wedding for Kimberley and Jamie including the wedding ceremony music and the wedding reception in the evening and there were two room turnarounds. The first was after the ceremony to set up for the wedding breakfast and then again after the wedding breakfast to the evening wedding reception itself. It was done to military precision and Anne the function manageress’ control, experience and planning was very obvious. Bunchrew House Hotel’s function room set up for the ceremony. 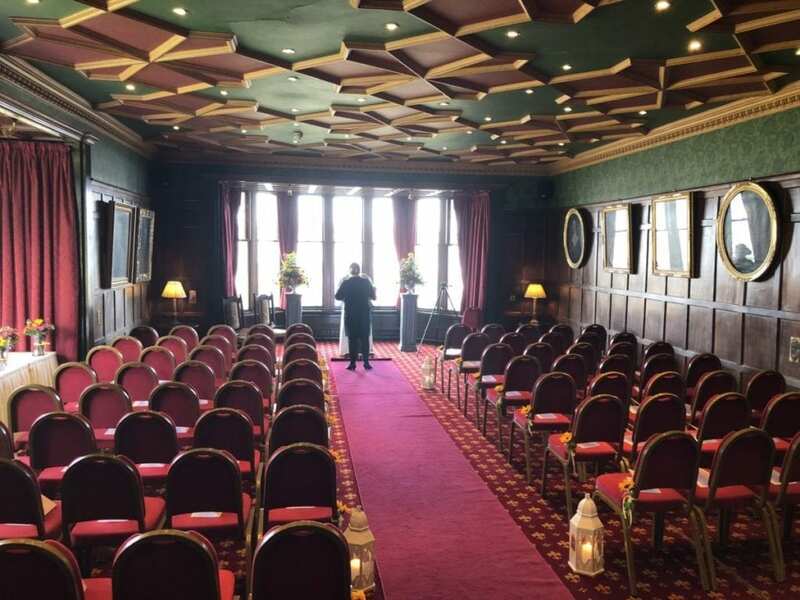 The wedding ceremony took place in this room earlier and it was quickly turned around to provide this stunning reception room for the wedding breakfast! I’m lucky to visit lots of venues throughout Scotland as a wedding Dj and I have to say this venue ticks every box for me. Perfect location, fantastic friendly staff and amazing food. Simply perfect. The second venue to have room turnarounds to perfection is The Huntingtower Hotel in Perth. Euan and his team are fast and efficient and open to new ideas which I’ll explain later. They are incredibly quick in turning the room around for the evening wedding reception. After 42 years as a Dj and having done thousands of wedding receptions I’ve experienced more room turnarounds than you’d ever imagine. I looked at this problem and thought of a very simple solution. When I’m providing a LED dance floor and disco or if I’m doing the ceremony music as well as your wedding reception and a room turnaround would normally be necessary, I set up my disco behind the top table where I’d naturally go anyway and put up a white drape as a backdrop for the top table. This means the bride and groom get a white backdrop for their photos and I get all my equipment set up early before any guests have arrived and it’s hidden from view. 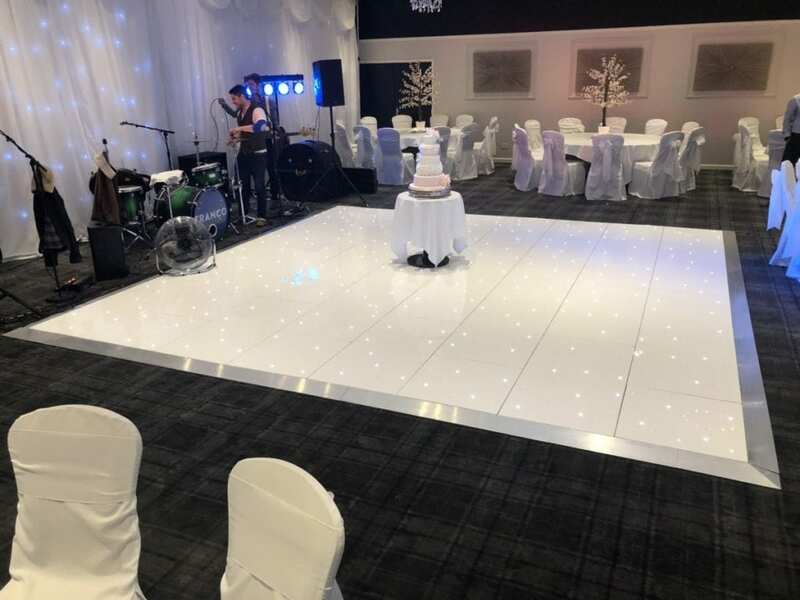 If you’ve hired a white LED dance floor for your wedding that can be stored there too which means it can be laid in half the time and avoids bringing in panels or trolleys while guests are close by which is far safer. My 20ft by 20ft white LED dance floor weights 685 Kg so I’m sure this brings it into perspective. I will provide the white backdrop for your wedding reception free of charge with a dance floor hire if I’m adopting this method to make room turnarounds easier as everyone benefits. White LED dance floor takes 30-45 mins to set up during room turnarounds . I can put all the dance floor panels and any other equipment behind the drape and it’s hidden from view and makes for an incredibly fast room turnaround. It really is the solution for wedding reception room turnarounds. The first time I did this was at Stirling Court Hotel in 2017 and at the wedding planning meeting I put across my idea to the bride and groom who were very happy with the idea. The function manageress was dead against it but the bride and groom insisted and it was done. It was to time to put my idea in motion and see if I could make room turnarounds easier. The room turnaround took 5 minutes instead of 45 minutes as all I needed to do was take down a drape and three poles. It really is the perfect solution providing your venue has enough room. I then used that extra time to put two sets of mood lighting around the room. I still had bags of time and the function manageress saw the advantage. People are often resistant to change, but luckily on this occasion I demonstrated how much easier room turnarounds could be and it was approved of. I suggested this idea to Euan at The Huntingtower Hotel in Perth who allowed me to do it as an experiment. It worked a treat again and every time I supply a LED dance floor and disco there it’s the way we do it. It works so well and has become standard practice for room turnarounds where I’m providing either music for the ceremony or microphones for speeches or a dance floor or photo booth as part of your wedding reception. White backdrop with disco behind it at Huntingtower Hotel Perth. The Popinjay Hotel in The Clyde Valley also have a large draped area at one end of their lovely function room and I hide my dance floor trolleys in there too along with their spare chairs etc. It really is the perfect solution and I hope more hotels will adopt the idea. Weddings very rarely run to schedule but I think this simple measure can help reduce delays. As the bride and groom please ask your entertainers if they can either set up early or store their equipment behind a drape. Venues with a separate dining area and function room are my personal favourite as I can set up at any time avoiding room turnarounds completely! I think the venue staff prefer this too and it’s good for you as your wedding is more likely to run on time. I hope you’ve found this article interesting and please try to think of your poor entertainers and suppliers when you pick your venue. My personal dislikes are stairs and huge long walks from my van to where the gear is going to be set up. A 100 Yard walk from van to stage 20 times means I’m walking just over a mile carrying equipment in both hands there and then another mile back empty handed. I then have to do it again at the end of the night before I drive home. People wonder why I’m strong, well carrying 20Kg plus in both hands for 2 miles a night has its effects! Some Djs have started to boycott certain venues with poor access or have significantly increased their prices to hire in extra staff to help with poor load ins or bad room turnarounds. The internet has made us all more easily connected and Djs are often members of organisations like Pro Dj Network where information on venue access etc is easily available. A Djs life is not the walk in the park some people think it is. It’s physically and mentally demanding and we’re not just there to push buttons to play music. Your Dj needs to know the basics of electricity and power calculations, venue knowledge of multiple venues and how to get there. Computing and lighting control, fault finding, website design and SEO, book keeping, diary management, marketing and sales, music of course and lots more. Photo booth hire Scotland | Aberdeen | Inverness	Beach weddings | wedding Djs |Scotland.